Better late than never! After searching in vain for one of the Prairie Fruits Farm & Creamery goat cheeses (rumored to have been served at an official inaugural dinner) prior to Jan. 20, I finally got my unmanicured hands on the Moonglo cheese over the weekend. Thanks to my new friend Benjamin, fellow cheese blogger and manager of the great Cheese Shop at France 44, Twin Cities residents can get their first taste of this Illinois cheesemaker’s offerings – and if you live here, you really should. Has this cheese passed the lips of our new president? Wes Jarrell and Leslie Cooperband opened Illinois’ first farmstead cheese-making operation in 2005, raising Nubian and La Macha goats and turning their milk into fantastic goat cheeses: fresh chevres, bloomy-rind cheeses and whole-goat milk ricotta. I purchased Moonglo, an aged, raw-milk tomme-style cheese. Jarrell and Cooperband wash the rind with a “tea” they make from Moonglo pear leaves. The result? A sumptuous, creamy cheese that coats the palate nicely and offers a pleasing tang. The fragrance may be a bit too “goaty” for some, but once again, this cheese passed the toddler taste test, so you know it can’t be too goaty. Benjamin from the Cheese Shop at France 44 recommends serving the Moonglo with a Chardonnay, and I’d add some luscious fruit to your cheese platter. Prairie Fruits Farm is also home to an orchard and berry patch, and when the summer rolls around, the Moonglo would be delightful with some fresh blackberries and peaches. A special note for Twin Cities cheese lovers: the Cheese Shop at France 44 received a shipment of 9 lbs. of Moonglo this past Saturday. Be sure to drop by before it’s gone! 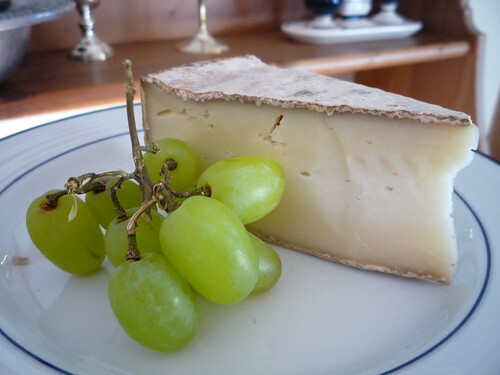 My cheese of the week also hails from the mountains, but from the range on the opposite side of France – the Pyrenees. 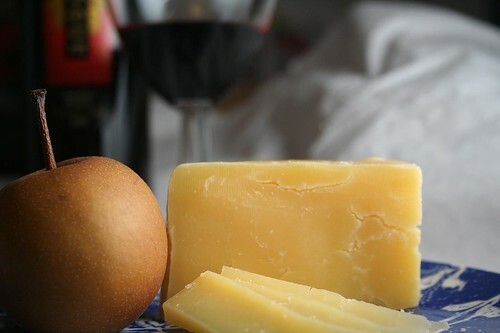 Ossau-Iraty is an raw, AOC sheep’s-milk cheese made in French Basque country, and its mellow, slighty oily flavor has become one of my favorites. Aged for 8-9 months, the cheese has a moldy rind that some eat, though I prefer to trim it away. I’d rather concentrate on the beige-colored paste inside the rind, which has a pleasing texture and firm bite. 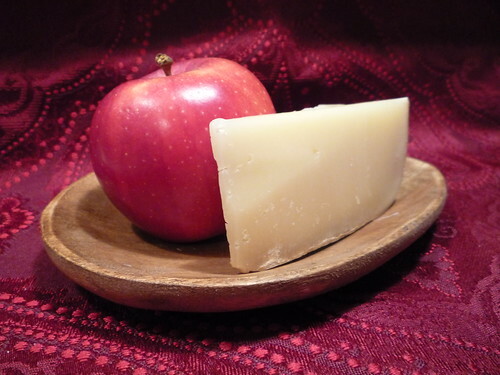 My friend Ariela and I once included Ossau-Iraty as one of three cheeses in our picnic lunch, and it’s really the ideal picnic cheese because it can be paired with so many foods – fruit (especially apples), olives, cured meats, nuts and crusty bread. Bring along a bottle of a big red wine, like a Bordeaux or Zinfandel, and you’re all set for a lovely meal. The Super Bowl has the tendency to bring out the guilty pleasures in all of us. Sitting on the couch for 5 straight hours – check. Getting excited for TV commercials – check. Eating food containing ingredients that sound like alien names – double-check. Even if you’re a cheese snob like the two of us, chances are that at a Super Bowl party you’ve consumed one of our country’s finest/notorious creations – processed cheese food. Admit it, you couldn’t resist that cheese dip or the nachos with the ooey-gooey, drippy cheese sauce. We have, and in vast quantities, too. Colleen’s husband’s Super Bowl specialty is the Velveeta cheese dip (combine cubed Velveeta and salsa, microwave to melt), and ever since moving to Minnesota my husband and I have made it ourselves for the Super Bowl. Yes, it’s partly because we miss Lou, but we also enjoy the freedom the Super Bowl gives us to inhale such food (if you can call it that). But this year we think we can do better – and we’re looking to our readers for help. We’re calling it the Cheese+Champagne Super Bowl Cheese Challenge. 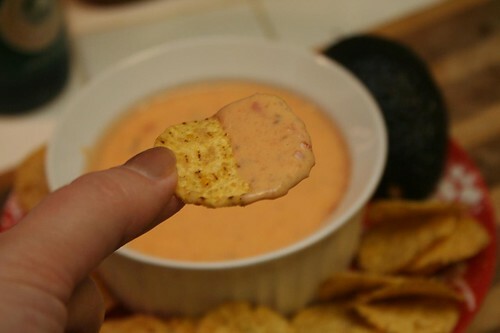 Can you recreate the smooth creaminess of processed cheese dip or processed cheese sauce using real, honest-to-G-d cheese? If you can, share your recipe with us! We’ll feature it, along with photos, on the blog and offer our undying gratitude for allowing us to remain cheese snobs on the most unsnobby day of the year. 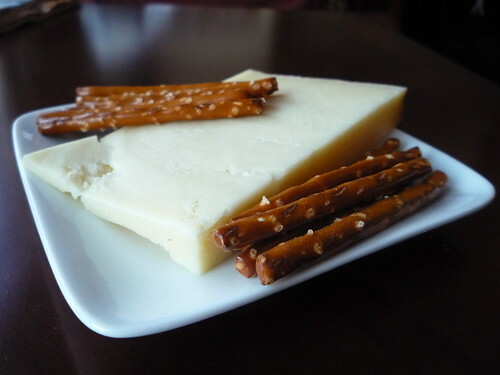 The mustardy flavor of Isle of Mull Cheddar makes it an ideal match for pretzels - and football. 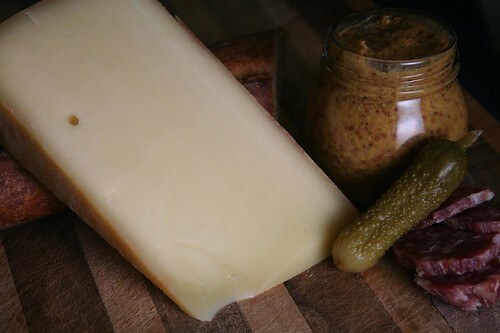 Beecher’s is a cloth-bound aged cheddar, made from raw (rBST-free) milk from a single local cow herd supplier. It has a smoother texture than your conventional cheddar. Slightly sweet, salty and delightfully nutty and sharp, it is well on its way to becoming a classic. 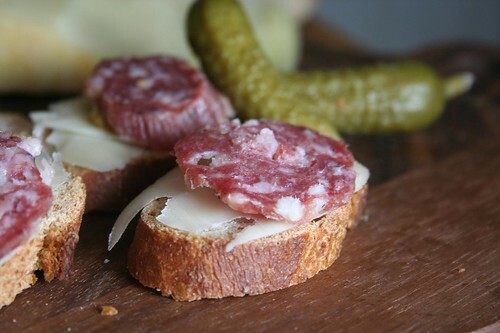 It can be hard to find on the East Coast, but has recently been spotted here at Cheesetique. Of course, you can order directly from Beecher’s if it’s not available at your local cheesemonger. Cheddars of course make ideal Super Bowl cheese picks, universally appealing and full-bodied enough to hold their own alongside spicy wings or other game day foods. If you’re sticking with beer, look for Seattle’s Red Hook or Pike Brewing Company. For wine, Hogue Cellars offers reliable bargain-priced wines (under $10) from Washington’s Columbia Valley, including the Cabernet/Merlot I sampled here. It was a touch overpowering, so I would go with a more medium-bodied red next time. Beecher’s suggests pairing the Flagship Reserve with a Syrah. 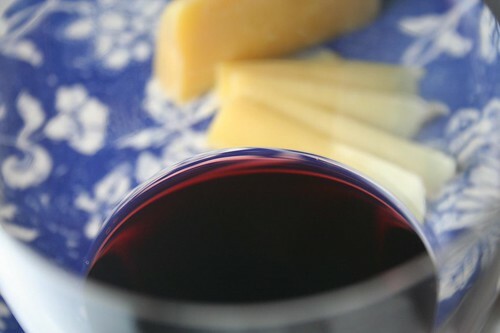 Updated 2/18/09 – The SFGate.com’s Janet Fletcher recommends pairing Beecher’s Reserve with Cabernet Sauvignon.